Turkeys are native to the United States and Mexico and are a food that was part of the traditional culture of the native Americans. Christopher Columbus brought turkeys back with him to Europe upon his return from the New World and by the 16th century, turkeys were being domestically raised in Italy, France and England. At first, they were reserved for the banquet tables of royalty, but their enjoyment soon became more widespread throughout societies. Turkey has long been associated with American history. Think turkey and images of Pilgrims and Thanksgiving dinners are evoked. Benjamin Franklin must have felt that the turkey was all-American because he wanted it to be our national bird and was upset when the eagle was chosen instead. But the turkey as an icon of America and freedom doesn't stop there—Neil Armstrong and Buzz Aldrin ate roasted turkey (well, space-food roasted turkey) as part of their first meal on the moon. Today, the countries that consume the most turkey per person include Israel, the United States, France, Italy, the United Kingdom, Canada and the Netherlands. I have not been able to log into Foodbuzz since Thursday, 11/24. Yesterday, I was able to log in long enough to accept a friend request, but that was all I was able to do. I sent Foodbuzz an email about the problem. I hope they fix the problem soon. I really want to log into Foodbuzz. I received versatile award from Ramona at Curry and Comfort. I am VERY excited and honored to be awarded. I am so happy to think that you thought my blog was worth enough to award me. Thank you so much! Preheat oven to 350 degrees. Place chicken broth, package onion soup mix, brown gravy mix in roaster and stir well. Place turkey breast in roaster. Add water. Roast until a thermometer inserted in the turkey registers 155 degrees, about 65 to 70 minutes. Remove from oven and let rest, tented with foil, for 15 minutes. The temperature should reach 165 after resting. Place on cutting board and slice turkey. Enjoy! Haha - that is very funny about Benjamin Franklin being disappointed that the eagle instead of the turkey was chosen as the national bird! Interesting way to make your turkey breast. That turkey slices are perfect with everything , as a sandwich filling , for savoury muffins , pizza toppings to name a few ;) Great recipe , Christine ! Packed into toasted slices of bread, this will be heavenly with the turkey slices. That turkey looks absolutely perfect. I agree with Anne... so many things you can do with it! Thank you so much for all your comments. I love hearing from you. Congratulations on your well deserved award! I love the onion soup in here. It's one of the few pre-made mixes that I use. The flavor is really good. Congrats on your award! I've been having problems with Foodbuzz lately as well. Someone suggested that it was my browser (Internet explorer) because I'm also having problems with Tasty Kitchen and Twitter. Thanks, Jen. I'm using Mozilla Firefox. Foodbuzz is the only site that I'm having problems with. I have been on 3 laptops in 3 different places, and still having problems with Foodbuzz. So I'm sure the problem is at there end. c\Congratulations on your award, so deserved. 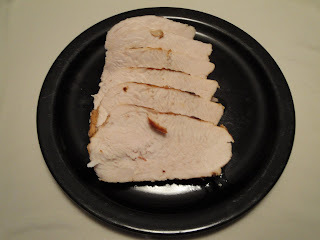 A cooked turkey breast is so versatile, dinners, lunches, and cassroles can easily be made. Ugh, I'm sorry about your trouble with foodbuzz...I hope someone more computer savvy than me can give you some pointers. Great turkey recipe for those other 364 days of the year! Your turkey breast looks delicious. I hope you had a fantastic Thanksgiving! Hope you had a wonderful Thanksgiving...Congrats on the award. Congratulations on the Versatile Blogger Award, Christine! So well deserved! I just love how you weave in all that history with your recipes! Truly awesome! This looks lovely and simple--Thanksgiving may be over, but turkey breast is such an awesome protein! Congratulations on your award! Hopefuilly you'll be able to log into your Foodbuzz account real soon, that website is really weird sometimes :( But onto this amazing turkey! It looks so delicious and moist! Nothing better than breasts all lined up like that!